Force Management works in the B2B space by providing customized sales consulting and training services to high-technology organizations. The company sought a strategic partner for campaigns to reach their niche target personas using specific messaging to reach them at the right time. They needed further support from an agency to provide strategy and execution for their Account-Based Marketing (ABM) campaigns to strategically target new accounts. The purpose is to drive awareness of services and nurture a specific set of companies through digital display advertising to develop sales qualified leads (SQLs). With such a specific target persona, it was difficult to directly influence the right people within an organization to influence the sales process. The marketing team needed a unified strategy to bring together all portions of their plan to enable the sales team to succeed. Specific platforms were needed to target specific accounts and implement the plan. Account-Based Marketing is a strategic approach for B2B marketing that brings awareness to specific influencers within an organization to impact and “flip” the sales funnel to align the marketing and sales efforts within a company. Through discovery and strategy sessions, we identified opportunities to integrate all communication channels including social (paid/non-paid), email, and direct mail. Additionally, services have extended to include support of key, high ROI potential, experiential events synchronized with ABM specific campaigns targeted at companies attending the event both pre- and post-show. Implementation included paid digital display ads, trade show marketing collateral, and direct video mailer designs. Targeted display ads for individuals within selected companies with specific messaging to meet their needs. Marketing collateral via direct mail and email reaching target accounts with specific messaging through different mediums. Design and implementation of video mailers to specific prospects to personalize and clarify the pain points and meet needs. 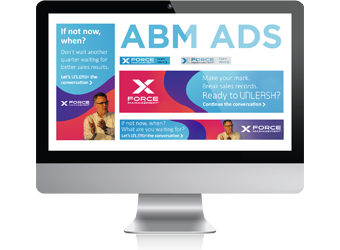 Within the first six months of the ABM campaigns, Force Management has engaged with specific companies that are otherwise very difficult to reach. The unified strategy of messaging across a variety of mediums allows prospects to learn about the company and its offerings before engaging directly, allowing them to make decisions on their own time. New customers acquired within a six-month time period. Active, open opportunities in the pipeline. Engaged accounts and 1,300 website visits from direct campaigns. Let’s talk about your next project.Check it out.